If you have access to a piano, try this experiment. Have a friend hold the “sustain pedal” down so that the strings are free to vibrate. 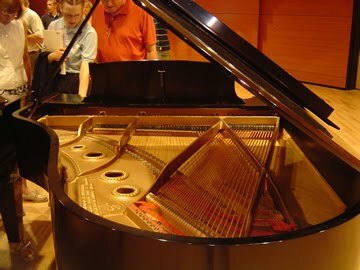 Position your head above the strings and sing a musical note into the piano toward the sounding board beneath the strings. The sounding board will reflect the vibrations. Some of the strings will have natural resonant frequencies that match your input. Only those strings will vibrate. Listen for them. The piano will sing your note back to you.